And while Lisa Page had the wits to quit shortly before the publication of the OIG report, Strzok did not and in fact was still employed at the time of the report's publication last Thursday. But maybe not much longer because as CNN first reported, Strzok was escorted out of the FBI building on Friday, even though he is still technically employed and, as we reported some time ago, he has been stationed in Human Resources since dismissal from Mueller team. Shortly after the report, Strzok's attorney confirmed the report saying that Strzok was escorted from the building amid an internal review of his conduct. 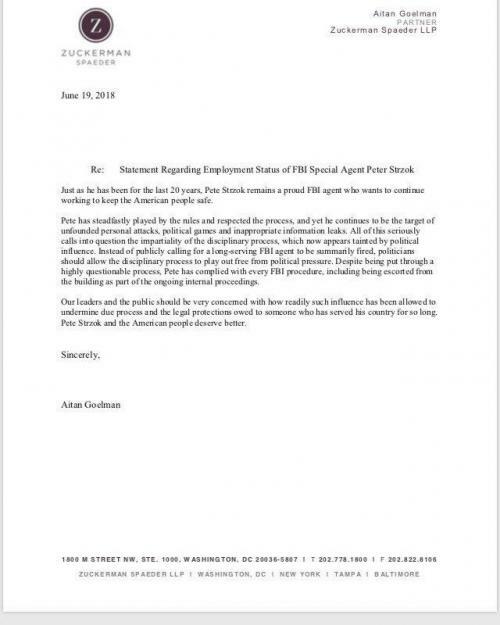 I'm glad to hear that Peter Strzok was finally fired from his job at the FBI, so that he can now become a full-time resistance member. To all this, all we can add is that while there is still zero evidence that Trump "colluded" with Russian, Strzok's expulsion from the FBI building is sufficient proof that the FBI was engaged in what effectively amounts to collusion, if not conspiracy, against a democratically elected US president. On Tuesday, Inspector General Michael Horowitz testified in a joint Congressional hearing to the House Oversight and House Judiciary panels about his review of the FBI’s (mis)handling of the Clinton email investigation.